The 25-year-old half-Dominican rap sensation made a memorable fashion statement on the red carpet at the American Music Awards, earning Best Dressed Latina honors for her floral frock. 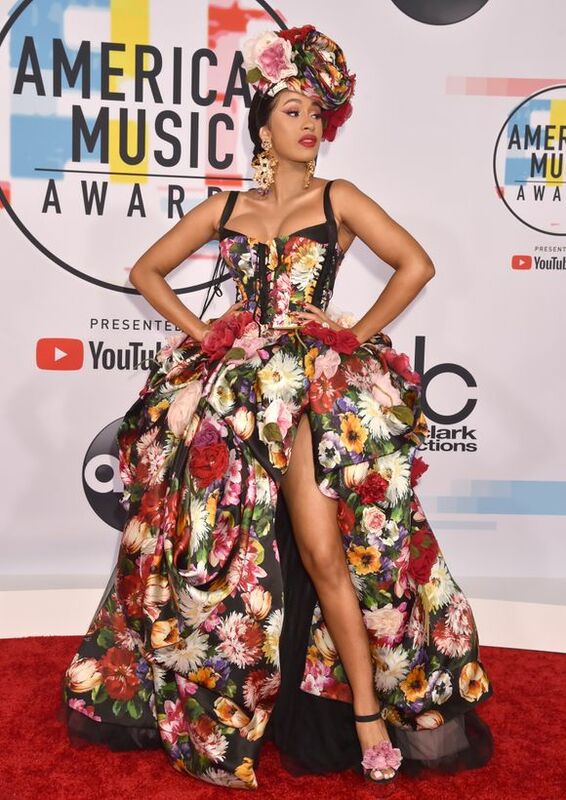 Cardi B, who picked up the first three awards of her career at theAMAs, wore a floral gown, complete with a lace-up corset style bodice. The “Bodak Yellow” rapper topped off her outfit with a matching headpiece. Jennifer Lopez slayed the AMAs red carpet in a hot-pink ensemble that had everything going for it… a plunging neckline, side cutouts and cape-sleeves. The 49-year-old Puerto Rican singer paired her Georges Chakra Couturedress with Jimmy Chooshoes and bag. Camila Cabello, who tied Taylor Swift as the night’s big winners with four trophies each, opted against a gown. But the 21-year-old Mexican and Cuban singer and former Fifth Harmony member still looked stunning in her simple black pantsuit and corset top. The “Havana” singer paired her outfit with Christian Louboutin shoes and Bulgari jewelry.